We Also Offer Wrapping Services at $25 per shell (customer pays shipping both ways) -- Keep in mind, however, we will only re-wrap shells with OUR WRAPS. Contact Us to request this service. 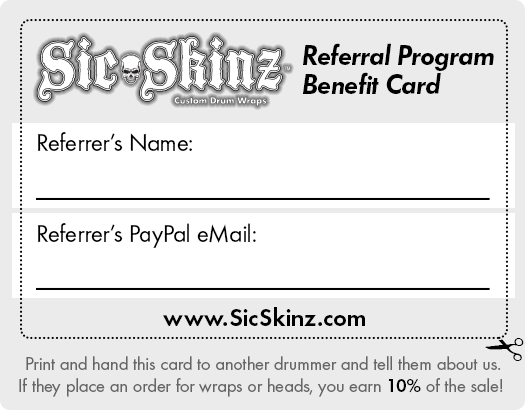 INTERESTED IN BECOMING A SIC•SKINZ WRAP OR HEAD RESELLER? Just download and print the card below, fill out the two spaces legibly, and hand it out to your friends -- as many friends as you like. If any of your friends buy a set of wraps or a drum head from us, we'll send you 10% of that sale as a finder's fee! Schools, Churches, Universities, Promotional, Manufacturers, Drum Builders, Drum Lines, Touring Artists... all are types that get "Wrap Envy"... help them get the cure from us, and get payed while doing it! "What if I have received one of these Cards? What good is it to me?" Well Friend, what it does is get you the opportunity to earn 10% when you share the wraps you just bought and put on your kit. People see your kit, people ask questions, you give them a copy of your filled-out card and say, "Here you go, reach out to them, they'll take care of you. Just tell them I sent you!"... that's all you have to do... They place an order and enter your info at checkout; you get paid when they get their wraps. See how it works? And then THEY tell two friends... and THEY tell two friends... and so on... and so on... The original "Viral Marketing" concept; revisited. Because, now that you've got a hole, what do you intend to do with it? You're going to PROTECT IT with our all new plotter-cut vinyl mic hole protectors, that's what you're gonna do! 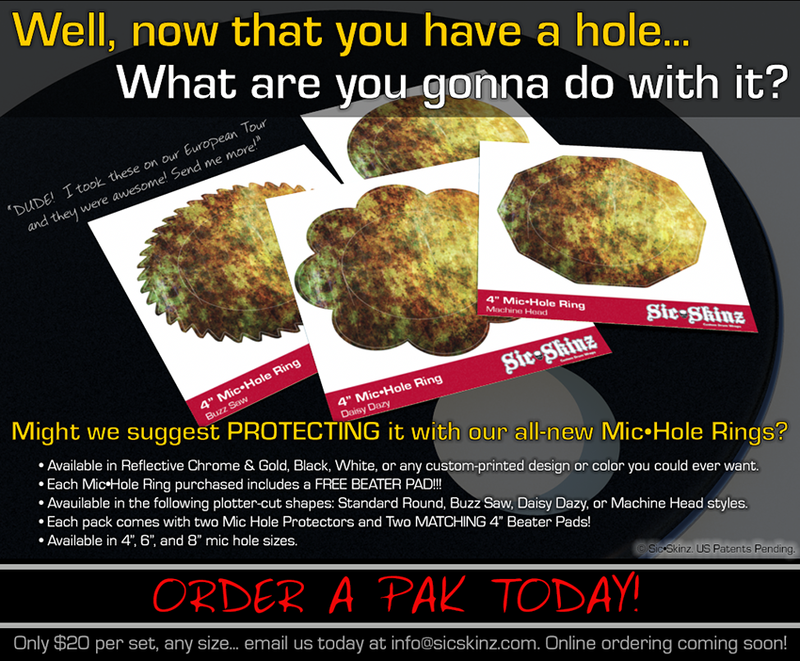 They come in 4", 6", and 8" mic hole sizes, and, even better is that each Mic Hole protector ring also comes with it's own 4" Beater Pad built in! Available in any color, chrome reflective, gold reflective, white, black... even 100% CUSTOM... all for the same pricing structure at $20 per pack of TWO sets. Contact us today to order yours! 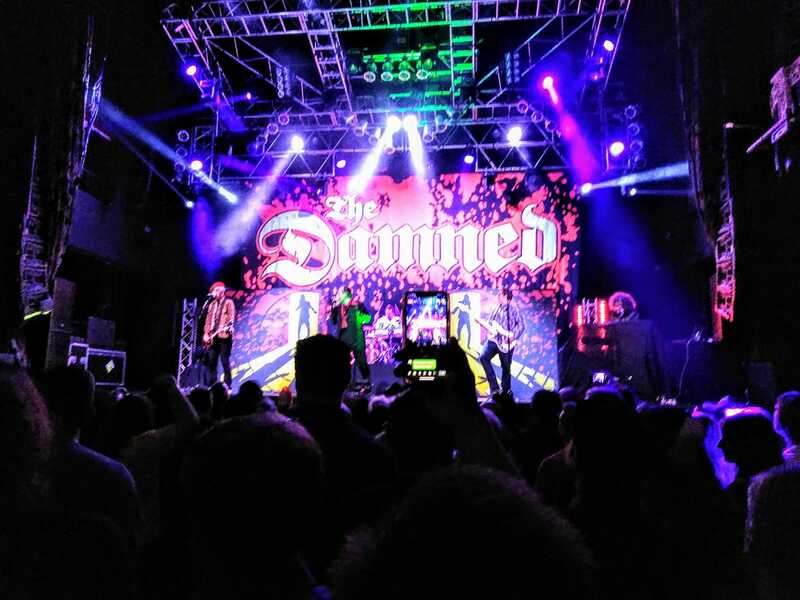 With a three day turnaround after graphics are approved, you can't beat this opportunity to make your band's image EXPLODE from the stage. We now offer single and double-sided banners in fabric and vinyl, side fill amp scrims, pop-up and hop-up display stands with either fabric or vinyl backers (fabric for stage, vinyl for merchandise booths/outdoor use), and even full size image coordinated event booths and tents! For a Copy of full line PDF Catalog, Please DOWNLOAD it here. Pearl Drum Corporation, Tama Drums by Hoshino, Revelation Drums, DW Drums by Drum Workshop, Sonor Drums, Rockett Drumworks, Spaun Drums, Orange County Drums & Percussion, Boom Theory, Silver Drums, Pork Pie Percussion, Precision Drum, Warner Brothers and QPrime, Mike Wengren of Disturbed, Charlie Benante of Anthrax, Butch Vig of Garbage, Tommy Lee of Motley Crue, Barry Kerch of Shinedown, Shawn Drover of Megadeth, Nick Menza (RIP) of Megadeth, Sean Kinney of Alice In Chains, Vinnie Paul of Pantera & HELLYEAH! (RIP), DD Verni of Overkill & Verni, Jason Bittner of Overkill, Ron Lipnicki of Overkill, Travis McNabb of Sugarland, Scott Rockenfield of Queensryche, Shannon Leto of 30 Seconds to Mars, Snoop Dogg / Snoop Lion, B.B. King (RIP), Wild Mick Brown of Ted Nugent, Prince (RIP), Daniel Erlandsson of Arch Enemy, Adrian Young of No Doubt, Tim Yeung of Morbid Angel & Death Division, Hunter Hayes, Russ Whitman of Craig Morgan, LouDog of Kottonmouth Kings, Alannis Morrisette, Scott Henderson of Agents of Chaos (RIP), Kobra and the Lotus, Rick Brothers of Gretchen Wilson & Colt Ford, Steve Moore - The Mad Drummer, Will Carroll of Death Angel, Lennon Lopez of Rotting Corpse... and countless local bands all over the country and abroad! © Sic•Skinz.com. All International Copyright Laws Apply. No images, content, nor publications shared from this site may be used without the strict permission of Sic•Skinz. Site design by Brien J Tomassetti.